The East Texas Men in Harmony barbershop chorus is excited to share their barbershop-style a capella with the East Texas community this Spring. We’ll hit the road beginning May 11th where the chorus will perform at Wise Auditorium at Tyler Junior College. The chorus is thrilled to share the stage at all three shows with world-renown quartet “Titanium,” a female barbershop quartet who recently placed 3rd in an international competition. A vastly talented, comedic and entertaining quartet, Titanium wows the crowds anytime they perform. 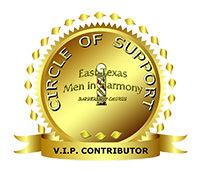 The East Texas Men in Harmony will perform a variety of songs from their impressive repertoire. Familiar patriotic, religious and vintage tunes will have the audience singing along and left wanting more. You’ll be glad you made the decision to join us for an afternoon in harmony!